I’m still frozen in the moment. Has it really been fifteen months since revolutionary socialist Kshama Sawant brought her unique brand of municipal socialism back to a major American city after winning an at-large seat in Seattle’s nonpartisan city council race? A well-respected activist with a reputation gleaned from her highly visible and capable role in the local Occupy effort and the fight to raise the city’s minimum wage, Sawant didn’t just adeptly mount the bully pulpit — no mean feat — but used her elected position to win palpable things. She didn’t do either alone; she had partners, including Socialist Alternative, her small group, with roots in the Trotskyist tradition and a trademark commitment to electoral politics. She also had the help (sometimes) of SEIU Local 775 President David Rolf, who spearheaded the campaign for a $15 living wage ordinance in the city. When a number of City Council members trekked last October to a mountain resort for the Seattle Metropolitan Chamber of Commerce’s annual leadership conference, Kshama Sawant ripped into her colleagues. She accused them of taking their marching orders from corporate executives. But the next month, the council adopted a new budget peppered with Sawant-sponsored amendments — including an immediate wage hike for city employees, money to support tent encampments and a commitment to study a possible excise tax on millionaires — and the opposite seemed just as accurate: Sawant’s colleagues were taking marching orders from her. Imagine, a Marxist with a life! Sawant is aware that focusing on her as an avatar (my word, not hers) “serves the establishment agenda to isolate one person and make that person look like a fist-raising robot rather than a human being.” It also serves the establishment’s interest to portray her as an isolated improvement over the rest of us strident, sordid, alienating lefties. So far Sawant is polling favorably in both citywide and district surveys. An October 2014 poll by EMC research showed her in a virtual tie among council members for top favorable citywide recognition, and ranked her far and away the highest when considered by voters in her new district. It also found her with the largest unfavorable rating of any council member. “That may not be a surprise, considering her loud and proud tax-the-wealthy agenda,” the paper said. So how effective has she been, as advocate for the 99 percent, on the council or off? As a spokesperson for social and economic justice and an articulator of real grievances, she seems invaluable. As a mover and shaker on the council, maybe less so. “This is a progressive city and council. They agree with a lot of what she wants,” said Christian Sinderman, a mainstream political consultant. “How much is she driving the dialogue? Less than she thinks.” Certainly more than Sinderman, an operative for other candidates, thinks. She’s even taken brickbats from self-styled progressives, with SEIU leader Rolf claiming that rather than being a catalyst she merely piggybacked on his $15-an-hour minimum wage fight, though there’s no question that she was a magnet for attracting support for the proposal. In another article, it notes “that the ballot initiative was intended as a way to pressure the Democrats, not to actually build an independent movement” — a charge it backs up with examples that have more to do with criticisms of Sawant’s and Socialist Alternative’s alleged thralldom to local labor leaders. That’s a serious accusation against any local official, who by definition is judged by district voters first on her constituent services record. Though it came from the head of the local Chamber of Commerce, it’s the sort of smear that could disenchant supporters, frame the nature of an endorsement, and gin up funding for opponents in the November election. It’s also a peculiar argument to make about any member of Socialist Alternative, a Trotskyist organization spawned by transplanted British comrades who were once members of a group primarily known by its weekly paper, Militant . The group distinguished itself on the sceptered isle’s radical left by holding the orthodox (“degenerated workers’ state”) view on the USSR and the decidedly unorthodox view that electoral politics necessarily meant “entryism,” or activism and constituent mobilizing in the British Labour Party. They were successful enough to win control of Liverpool’s city council (again, no small feat), elect a handful of supporters to parliament, and by the 1970s, win support from a majority of members of the Labour Party Young Socialists. They even had a supporter named to its National Youth Organizer spot in 1976 — until they were expelled by the party leadership in the 1980s. The first national attack from outside the party: the Observer ’s inelegant 1975 headline “Trot conspirators inside Labour Party.” That was on a par with coverage from the US’s all-time sleaze writer, Victor Riesel, who false-alarmed readers about a genuine democratic effort, calling it “a deliberate conspiracy to infiltrate and take over Britain’s second major political party” and one that “couldn’t have succeeded as swiftly as it has without the support of some British unions.” Brits, hide your kids! By 1991, after a nearly two-decades-long witch hunt and a series of expulsions under then-Labour leader Neil Kinnock the group exited and soon fragmented, though its progeny are still active in the British left, especially in Scotland. Why this tiptoeing through long-dead Trotskyist tulips? The thing to remember is this — the various incarnations of “entryists” operated as open left-wing socialists in mass organizations. Rather than painting themselves into a corner or acting as Bolsheviks on the wrong bus, they spoke in a language ordinary people could identify with and which, in the US, Sawant is so far doing well. Case in point: Sawant’s insistence at last spring’s Labor Notes conference that not only was it important to campaign as an open socialist but that it was crucial to advertise yourself as a promoter of a particular, even small, organization. In Sawant’s case she ran under the Socialist Alternative banner (so much for united fronts in practice). Forget her belief that a particular Leninist brand is necessary at this time or that her good work is ineluctably linked to a line on Ukraine or such. Watch what she does. Her voters will, and so far they like what they see. 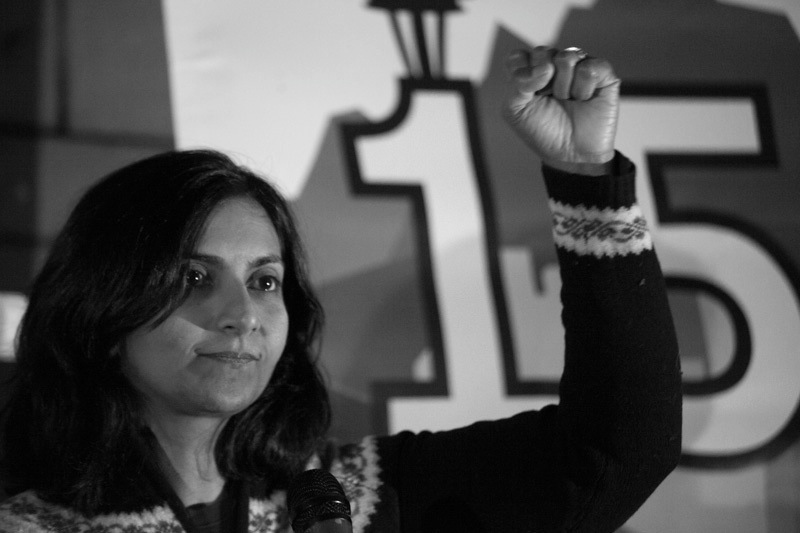 Sawant is also one of the key endorsers of the Solidarity-organized May conference in Chicago on building an electoral alternative to the two mainstream, corporate-enabling parties. For the revolutionary left to talk about common goals instead of sanctifying differences and prizing one’s own insular network is a good thing. I’ve endorsed it, I’ll be there, I hope it succeeds, and you should be there too. Even if it’s the longest of shots, it’s still worth trying again.